In too many organisations the employees get tired of a lack of information or the feeling that attention is not paid to their views. There is either too little information sharing, the information does not reach the personnel, or there is too much information. At worst, the employees may feel that their work is considered meaningless. So how do you make the employees work towards common goals? At its best, internal communication motivates and assists the employees in understanding what the company is striving towards. Effective internal communication requires suitable means of communication. Remotely updatable info displays are the 2020s version of a notice board. Real-time digital displays make sure that information from the head office reaches the factory assembly lines and coffee rooms. 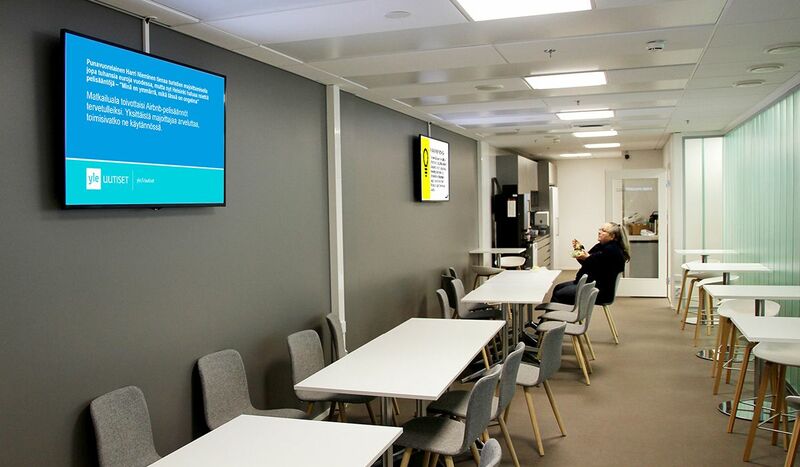 With Digital Signage displays the information can be taken wherever the employees are. With readily available information, no one can any more spread their arms and say they’ve never heard of that. Open and regular communication commits employees, and info screens are an excellent tool for this. The screens can display key figures of the company or production and quality indicators so that every employee has equal access to the information. Having said that, Digital Signage displays should not be only a channel through which the management provides information to the employees. Instead, they allow participation of all personnel in development of the company. For instance, the employees might be asked what would help them in doing their job better, and the answers could be published on the screen. As employees can participate in decision-making and creating a better working environment for themselves, their commitment to the company increases. 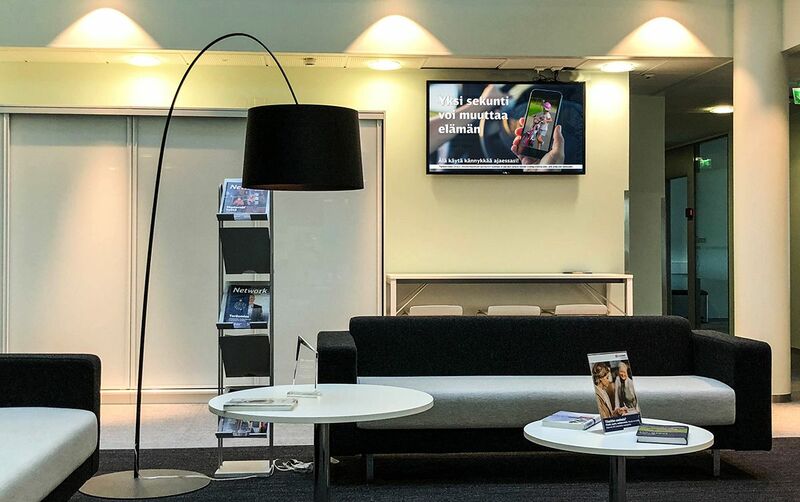 If the employees are divided among different premises or even different parts of the world, Digital Signage can even create a sense of belonging to the community. Celebrating achievements or anniversaries or welcoming new employees create a sense of community even if the workers never see each other. Sense of community can also be created through employees’ own pictures. The employees can for instance be encouraged to share their pictures with a specific hashtag and the content are then highlighted on the displays. Travel photos, culinary masterpieces and other adventures create a sense of community. There is no doubt that the employees are the most important resource of the company. When employees feel good and respected, they cope better with their workload and become more effective. But how to increase commitment of the best employees? According to research, the best way to increase employee commitment is positive feedback and praise from the management. Development discussions once a year are not enough, if at the everyday work the employees feel they are not given enough attention. The employees should be continuously encouraged and motivated with acknowledgements. Displaying the acknowledgements or the employee of the month on the digital signage displays makes the feedback visible to the entire company. Especially for the younger employees the relevance of the work is more important than the pay check. If the employees are unfamiliar with the values and aims of the company, they may assume that the only aim is to make money. Through digital signage it is possible to correct this kind of fallacies. For instance, if the company wants to make the customers the centre of their operations, the importance of customers can be highlighted by displaying customer feedback on the displays. This way, customer orientation is not merely fancy words, but the displays remind the employees every day about the aims of the operations. Info screens can also depict an image that the employer cares about the employees. The screens can for instance encourage towards attaining a healthy balance between work and spare time or show work safety videos. This way they are not only increasing safety at work, but also produce a positive image of the employer. Small actions can make the gap between the employees and the management smaller, creating an image that the company is open, appreciates its employees, and takes their concerns seriously. When we talk about Digital Signage, we are not talking about equipment. Having a screen is not a saviour, if we have no idea what information the employees need or what motivates them. When the objectives are clear, digital signage is an effective way of reaching and committing the employees. Contact us and we will help you find a solution that suits your company!